Lošinj is an island paradise unlike any I have experienced before; not in the Caribbean, the North Pacific, the South Pacific or the Mediterranean has an island so captivated my heart. Of course there are other bodies of water I have yet to explore but suffice it to say, Lošinj is special. 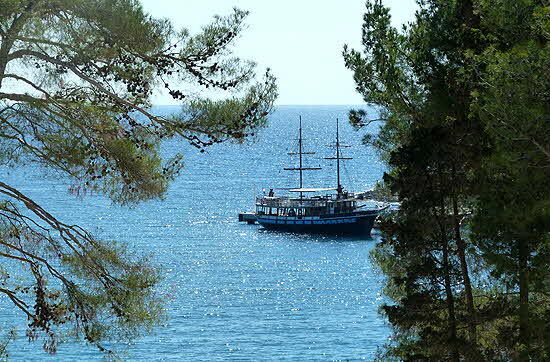 Located in the Croatian archipelago just off the mainland, it appears to be adrift in the royal blue Adriatic Sea, beckoning those that have the desire to go that extra mile to get there to take advantage of her well-known health benefits - not for nothing is Lošinj called the Island of Vitality. So imagine my surprise to find not only the natural beauty and healing environment I expected but also a gastronomic tour-de-force that caused me to gain over five pounds (approximately 2.7 kilograms) during a five day stay. Of course pushing myself away from the table after merely tasting the volume of food placed before me – instead of consuming everything but the plate - was a challenge my will-power gleefully overcame. 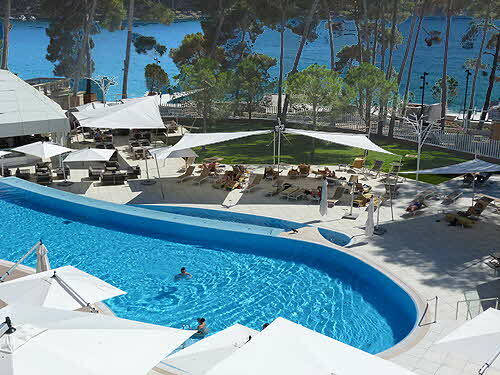 The hotel during our stay was the 5* Bellevue in the city of Mali, Lošinj. Mali means small but the city is actually larger than its sister city Veli, Lošinj which mean larger but is actually smaller... don’t ask. Regardless, the Bellevue has been completely revamped and is the standard against which all other hotels on Lošinj will have to measure up. The arresting entrance flanked by large white columns accented by indirect lighting, and the atrium lobby with its stunning Italian rose marble columns and floor-to-ceiling wall of spiral Ammonite prehistoric fossilized shells, set a new benchmark of luxury. The Jadranka Group is responsible for the upscale development on Lošinj and is in fact the fifth largest Croatian tourist company and the biggest employer in the Lošinj-Cres archipelago. They currently operate six hotels, three villas and apartments as well as six restaurants… and we have a natural segway back to food! I was traveling with a small group, all foodies like myself and we laughed and ate and drank our way though all of the Jadranka Group’s restaurants, some attached to hotels while others are free-standing. The excellence of the cuisine is in part due to the seclusion forced upon the islanders by their isolated location; in part due to time-honored recipes developed using local ingredients. So locally caught fish and seafood, along with island raised lamb, are mainstays that call for simple and healthy food preparation using locally grown olive oil and fresh garden vegetables. Seasoning is complex using herbs that grew wild on the island (but are now cultivated) giving the cuisine its own unique flavors. 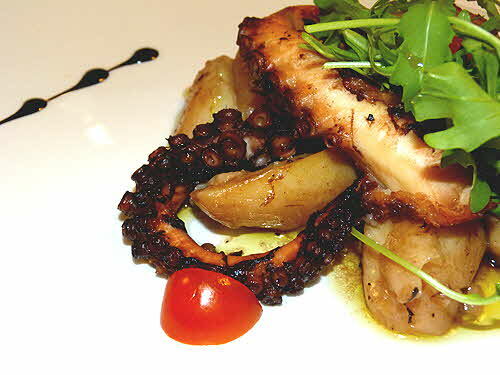 How many ways can you prepare octopus? Go to Lošinj and count! The local wines -- mostly Malvasia, Muscat and Cabernet Sauvignon -- are very drinkable and compliment the fresh, simple, ingredients. Our first taste of Lošinj’s cuisine was dinning al fresco at the Lanterna Grill Bar looking west as the sun set over the smooth as glass Adriatic Sea. We started with octopus/roast potato salad, dressed with white marinated fresh anchovies (boqurones) over greens and carpaccio of tuna with capers, served with home-made bread island style. Soup made in house from fresh ingredients accompanied every meal and in this case it was wild asparagus. A salad of delicious tomatoes and freshly picked rocket (greens) flavored with island olive oil and lemon came next - not a side salad mind you, but a full-blown bowl, almost a meal in itself. The entrée was a plate of grilled tuna and sea bass filets with crayfish on top and grilled baby squid over local swiss chard and potato. The wines were a 2011 Cabernet Sauvignon Vina Laguana 2011 and a fresh white Kozlovic Malvasia 2014 from Istria. 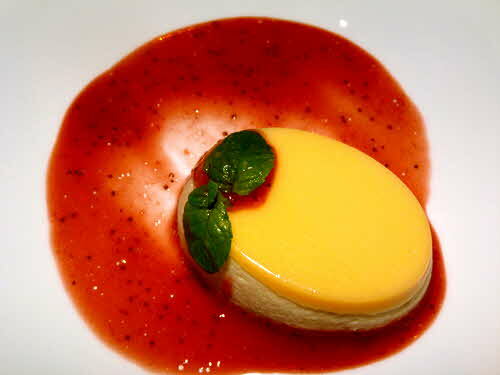 For dessert we were served lemon mouse with rhubarb sauce. The recipes are traditional along with the huge portions, and yet the islanders are modest in size, attributable I think to their healthy food and environment. 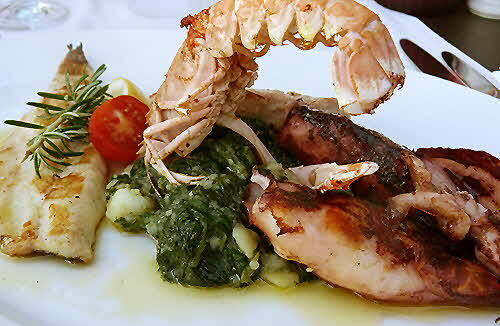 Lunch proved to be as sumptuous as dinner and just as captivating at Borik Mediterranean Bar. The sun was warm and the air was exceedingly sweet as we sat inches from the brilliant blue water that this area of the Adriatic is famous for. 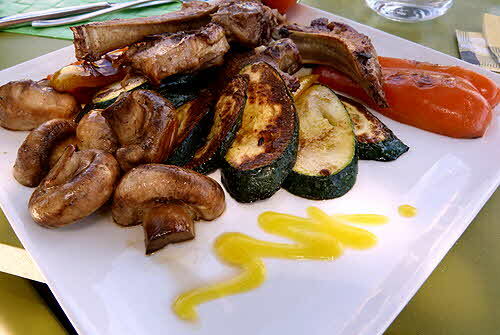 The specialty of the house is grilled lamb and fresh garden vegetables that were some of the best I have ever tasted – zucchini, aubergine, red and yellow peppers, mushrooms and tomatoes over a huge stack of chops. Of course this was after a large salad of freshly harvested local produce and the ever present bowl of home-made soup and before a positively decadent dessert of crepe filled with mascarpone and cherry pureed from locally grown fruit… be still my heart. I am not normally a dessert person but every time I thought I would pass, gluttony won out and I could not refuse any of the delicious confections. Our dinner the following night was at the Bellevue Hotel’s Brava Restaurant. A buffet of island specialties awaited us such as snails out of their shell on toast, tomato tureen (which was my first but hopefully will not be my last taste of this amazing dish) sautéed scallops with curry dusting, pumpkin puree, cauliflower soup. The entrée of lobster encrusted sea bream over pureed potatoes, roasted artichokes and the dessert of apple tart with cream were served along with the now familiar local wines. 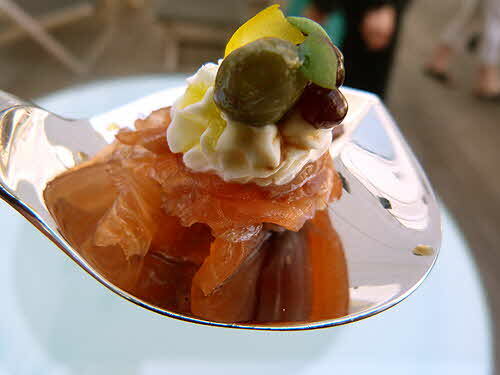 I was beginning to get the picture that meals consisted of five courses and one was more delicious than the next but in each case, preparations and selections varied. Dinner at Veli Žal Restaurant in Mali Lošinj was a repeat of beautiful view, wonderful tasty food and cheerful service as was dinner at Restaurant Diana in beautiful Čikat Bay just a short walk from the hotel. TRS Restaurant in the village of Krčina on the island of Cres also specialized in lamb and lunch at Punta Vitality Hotel had an awesome view over the sea in addition to a great meal. One of the most memorable days on Lošinj was a sail boat ride on the “Alhambra” to the islands of Susak and Ilovik where we had lunch. Susak is the only all-sand island in the archipelago and is a geological mystery. 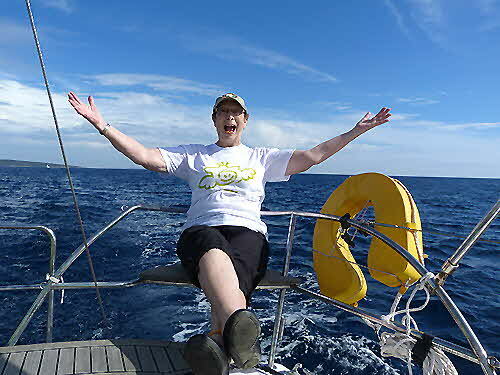 The sea here is warm, clean and inviting and you can practically walk to the horizon in knee deep water. Standing in the placid water with tiny fish swimming around my legs was magical and I could almost hear the siren sound of old calling me to come closer, all the while enticing warm breezes planted silent kisses on my exposed skin and a church bell in the distance chimed the hour. Lunch on the island of Ilovik was at Dalmatinka, on a platform built over the water where we again had a selection of traditional appetizers and salad with shrimp risotto taking the place of soup on this occasion. 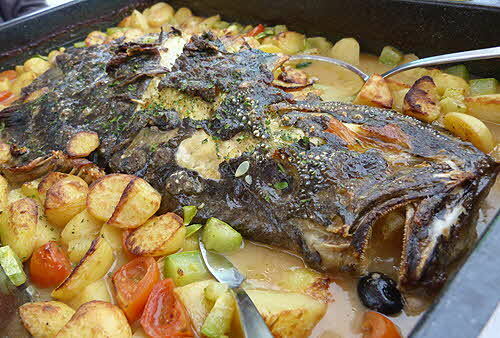 The entrée was an amazingly ugly but incredibly tasty whole turbo – freshly caught by the restaurants own fishing boats - baked with potatoes, zucchini, carrots and tomato. 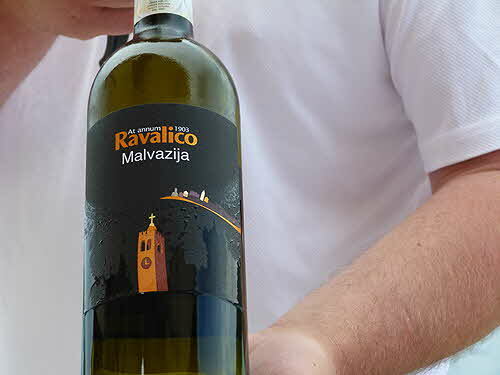 Wine was a 2013 Ravalico Malvazya (Malvasia) and Bortonigia, both from Istra. Again dessert was a crêpe filled with vanilla ice cream and chocolate sauce. We ended the meal with “Medica” a brandy honey (mead) made on premises. At sunset we met on the terrace of the Bellevue Hotel as guests of Werner Cerrutti, CEO of Lošinj Hotels & Villas for cocktails and a delightfully creative selection of hors d’oeuvres. Dinner was served in the àla carte restaurant Pin & Oil where once again a delicious spread was placed before us ending with a dessert Muscat from Kozlovic. It was hard to leave Lošinj and its warm friendly people and food that gave new meaning to “farm to table” cuisine. I did not notice slow cooking or deconstructed fancy food, just fresh delicious healthy cuisine with eye appeal and eye rolling taste appeal. An expanded airport is under construction that will accommodate scheduled flights from many European destinations but for now, and the foreseeable future, there are only a few ways to reach Lošinj; by sea, by car from Zagreb to ferry and then another auto trek, or by private plane operated by King Air. I believe Lošinj is worth a little extra effort to reach and I think your stomach will agree. © August 2015 LuxuryWeb Magazine. All rights reserved.